When it’s cooked, take out and leave to rest for 15 minutes, this will ensure the meat stays moist. For the gravy you blend together onions that have roasted in the same pan as the chicken, with the roasting juices and fat, with a little orange juice, wholegrain mustard, salt and some hot water. You don’t need any flour to thicken the sauce because whizzing up the mix causes the fat to emulsify it all. I’m not sure if this is the healthiest gravy but it is certainly the easiest. You don’t have to skim off any fat (which to be honest I’ve always found impossible to do right), you don’t have to make a roux or add any sort of flour, you don’t need to reduce anything… It’s so simple – and honestly it tastes great. I used a free-range chicken from one of the supermarkets for this – it tasted great. To be honest, this recipe will make any chicken taste great. But I didn’t go on to boil up the carcass afterwards to make some stock because I if I’m going to be doing that I want to get one of those organic chickens. They are twice the size of the chicken here and four times the price – but it’s worth it. The taste of an organic chicken is just … can’t be beat. Also making stock in this apartment feels like you’re in an oddly-chicken-smelling sauna. Oh, just one last thing to say – don’t wash your chicken. I personally never washed a chicken. I wasn’t even aware that people do that – wash their meat and fish? Then I heard a bit about it on the radio one day. Some people do that. Don’t do that with your chicken. 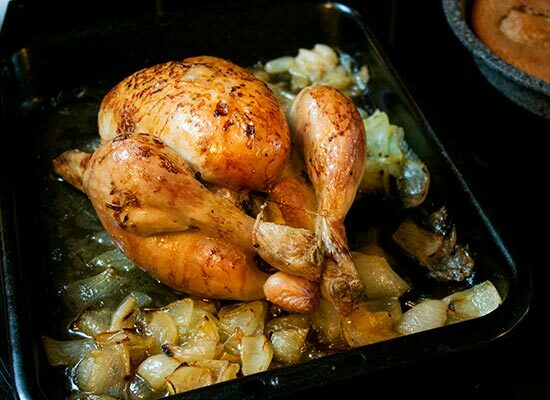 Washing raw chicken before cooking can increase your risk of food poisoning from campylobacter bacteria. Didn’t I used to have issues with cooking chicken though? And it’s not like I ever washed a chicken. Um … yeah. That’s true. But I was a pretty terrible cook prior to years of seriously “trying” with twimii. The rather obvious – and for most people unnecessary – advice I could give is – if it’s hovering in or around the use-by-date and it already smells slightly wrong … throw the damn thing out. Come on it costs less than a fiver. It’s not worth it. I know that last piece of priceless advice has probably scared you off but honestly forget all that and just try this recipe you’ll be surprised how good this chicken – and gravy – tastes. Chicken, orange, onions, garlic, celery, thyme, salt, pepper and olive oil. Turn on the oven to 200 C.
Rub some olive oil all over the chicken. Sprinkle with salt and pepper. Into the cavity place the onion, celery, orange, garlic and thyme. Place on an oiled and suitably sized roasting dish in the middle of the oven for about 30 minutes. Take the chicken out. Whatever juices have been released by the chicken, tip the dish, collect them in a spoon and pour over the chicken. Sprinkle the onion with a little salt, pepper and thyme leaves, Surround the chicken with the chopped onion. Turn the oven down to 180 C and put the dish back in the oven. During this time take the chicken out once or twice and again spoon the roasting juices over the bird. Also move the onions around at these times so they roast evenly. When the chicken is done take it out and leave it, in the pan, to rest for 15 minutes. This is very important as it will keep the meat moist. Then remove it to a serving dish. Now scrape all the onions, juices, fat - basically anything left in the pan into a large microwaveable bowl. Add in the orange, mustard and a sprinkle of salt. With a hand blender blend to as smooth a consistency as you like. Taste and add a little more salt if necessary. If it's too thick add a little more hot water. If it's not as piping hot as you'd like microwave it for 30 sec to 1 minute depending. If there is twine on the bird, leave it on while it cooks and then cut if off before serving. If you have leftovers on the bird, remove the stuff you've put in the cavity and discard before putting the chicken it in the fridge. The leftover meat on this makes for great sandwiches or salad. Bird’s been seasoned, oiled and stuffed with orange, thyme, celery, onion and garlic. Ready for roasting. Move the chicken on to a serving dish and add all the onion and juices from the roasting pan into a deep bowl. Add some freshly squeezed orange juice, mustard and some hot water to the bowl, before using a hand blender to blend. Roast chicken with the gravy. Orange and Thyme Roasted Chicken with some gravy, a very well done baked potato and some peas.